I love Trader Joe's, I'm a regular customer and I'm always eager to see what new items they put out! They have had some really delicious new items this summer but I think my favorite has been the Wild Blueberry Vanilla Chèvre! Now, I know what your thinking (cause I thought the exact same thing), "Oh my gosh that sounds SO yummy! ....but what do I do with it?" its not the type of cheese you just slice up and munch away on, but I have found the BEST way to showcase this delicious sweet and tangy cheese! 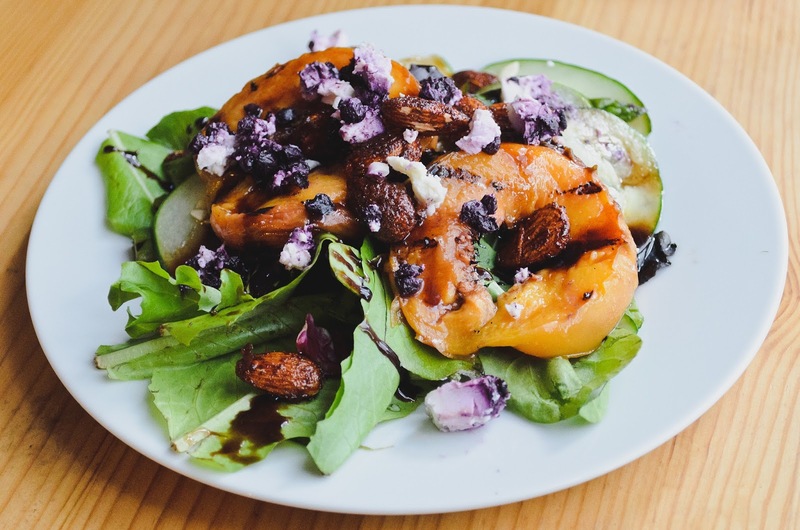 This yummy summer salad is made up of grilled peaches and asparagus, mixed greens, fresh cucumbers, candied almonds, Wild Blueberry Vanilla Chèvre and drizzled with a salted balsamic honey syrup! 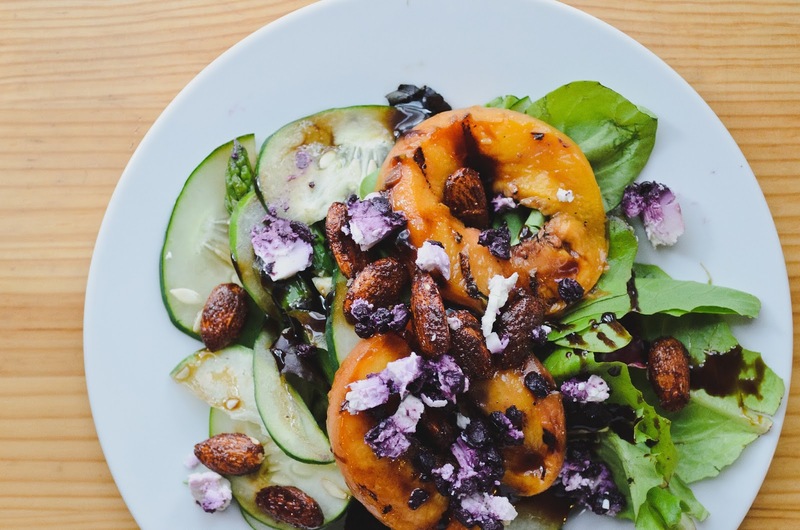 The grilled Peaches and Asparagus have that oh so tasty smokey BBQ flavor, while the cucumbers and almonds add crunch and texture, top the whole thing off with the creamy sweet and tangy Chèvre and a drizzle of the salted balsamic honey syrup and your in summery salad heaven! It's also super easy to put together! To me this is a perfect summer dinner and now is a great time for utilizing Peaches in your cooking (not just baking) because August is National Peach Month!